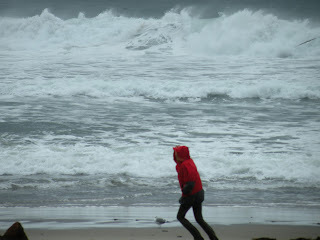 When whales burst from the sea in joyful exhilaration they humble us with their awesome power. 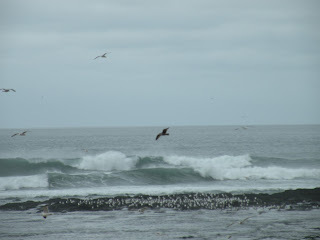 Making the longest migrations of any mammal on earth from chill waters of Alaska to Baja California they rely on ancient knowledge to guide through treacherous seas. Today their challenges are greater than ever from congested, noisy shipping lanes, to pollutants and plastic in our oceans. The creation of the Whale Trail with over sixty designated viewing sites on the Pacific Coast from British Columbia to California is an attempt to bring greater sensitivity to the needs of the largest, and oldest creatures on our planet to survive. 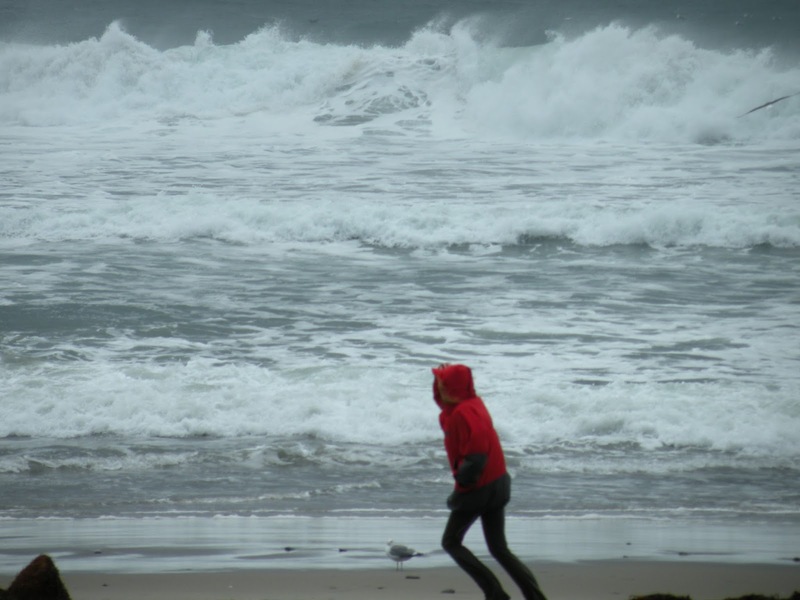 Six viewing sites have been identified on the Central Coast of California; in San Simeon; Moonstone Beach in Cambria, the pier at Cayucos; the bluff trail in Montana de oro State Park; the Avila Pier and at the Oceano Dunes Overlook at Grand Avenue. I visited the Piadras Lighthouse in San Simeon that sits on a lonely peninsula jutting out in to rough seas crashing over sea stacks. Docents led tours through the manicured grounds garner good viewing spots for a variety of marine life, including the whales during migrations. 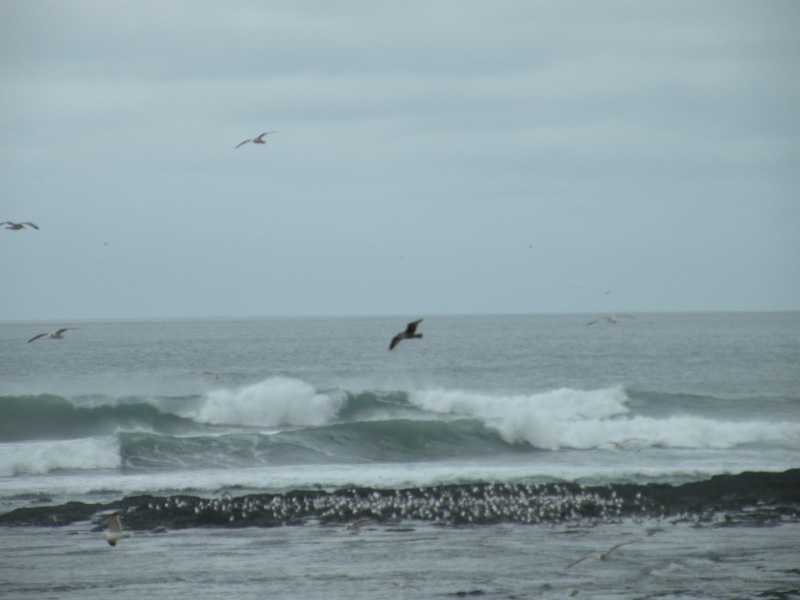 A fluffy otter was floating on his back oblivious to crashing waves while Elephant Seals lay sprawled on the shore. Rancho Del Oso Nature Preserve turned out to be a local favorite. 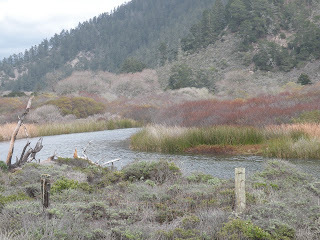 An easy, wide trail winds through beach, marsh, stream, and a riparian corridor. Self-guided trail maps can be easily obtained at the nature center about a half-mile into the park. Guided walks are provided on the weekends by docents. A horse camp is available for equestrians who bring their own mounts. Along with the equestrian trails in the park are trails for hikers and bikers. 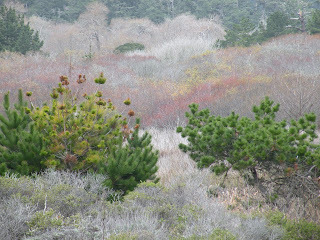 Monterey pines, mixed woodland, redwoods, coastal scrub, and mountain chaparral create a collage of color and shapes fringing the broad meadow of the Theodore Hoover National Preserve bordering Waddell Beach Park. Most hikers are content to take the lower trail from the beach up to Berry Creek Falls, felt by many to be the most beautiful falls in all of the Santa Cruz Parks. Across from the falls is a platform with benches affording fine views and a good place to picnic. The clever hiker can have a friend drop them off at the Park Headquarters at the top of Big Basin and hike about five hours down to Waddell Beach. An afternoon bus from Waddell Beach returns to Santa Cruz. Be sure to check times and schedules before making that commitment. The ambitious hiker may take the Skyline-to-the-Sea Trail thirteen miles to the top of the basin and enjoy extravagant vistas. Big Basin is California’s oldest state park, established in 1902 to save the ancient redwood forests. 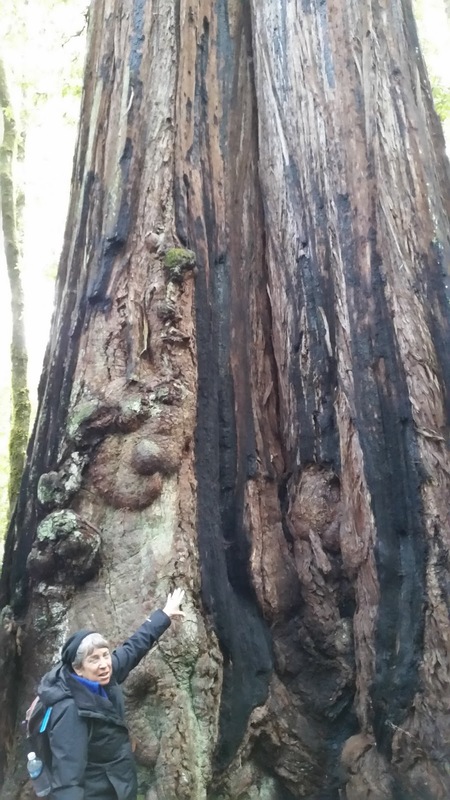 The park has grown to more than 18,000 acres with more than 80 miles of trails passing among streams, waterfalls, and old-growth redwoods. Redwoods were heavily logged in the basin by William Waddell from 1867 to 1875. Logging stopped when he was killed by a grizzly bear, and the valley became known as the canyon of the bear. Grizzly bears have not been seen in the area since the 1920s. In 1913 Theodore Hoover was able to buy much of Waddell Creek watershed. His Rancho Del Oso encompassed about 3,000 acres, reaching from the ocean to the boundary of Big Basin Redwoods State Park. Since that time, five generations of his family have lived here. There are still private family homes bordering the parkland. I felt a twinge of envy as we strolled past the neatly trimmed redwood homesteads of his descendants. The sun was smiling on their meadow bright with yellow wildflowers, dotted with persimmon trees heavy with orange globe. Neat rows of purple cabbage and a variety of lettuces fanned across the foothills. A thick hedge of berry bush brambles surrounded the fields to keep the deer and wild pigs from harvesting the crops. We crossed a wooden bridge and walked beside Waddell Creek where the remains of a cement weir are used in the biological study of fish. During spring and winter months you may see mature steelhead and salmon in deep pools. President Hoover, an enthusiastic angler, fished here when he visited his brother. As a state park, the stream is now closed to fishing. 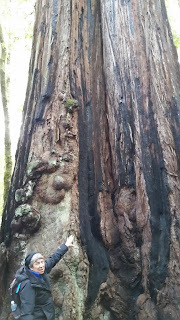 When we entered the deep redwood forest, the temperature dropped ten degrees. The cool breath of the towering monsters felt like a deep drink of soothing water. Lacy ferns nestle at the base of the trees ensconced in brilliant green moss. A gauze of Spanish moss draped the upper limbs of the evergreens. Warblers flashed through the still forest, illuminated by beams of light streaming through the protective arms overhead. I strained to see the birds I heard chirping. A kingfisher, a red-tailed hawk fat from easy pickings, and the flash of a stellar jay were all I could see. As we were leaving, a wedge of pelican came in for a splash landing in the estuary. Curlew poked for treats in the mud at low tide. I wanted to stay longer to explore quietly on my own, but the fog was rolling in and it was time to go. I vowed to return to see the wildflowers in the spring and feel the cool forests in the summer. The constantly changing panorama of this natural wonderland is so varied it demands that the hiker come back for more. Rancho del Oso Nature and History Center is within the coastal section of Big Basin Redwoods State ParkYou may park at Waddell Beach Park across from the trail head to Rancho Del Oso. There is parking on the surf side of the Highway. You can explore the wetlands, rocky tide pools, or hike anytime of the year. Big Basin Redwood State Park Headquarters, where the Skyline-to Sea-Hike begins, is hosts to numerous trails spiraling throughout the redwood forest. There is also a nature museum with stuffed animal, bird, and inspect specimens on display. Boulder Creek, a charming village nearby Park Headquarters is a good place to stay. Subscribe to my blog www.LindaBallouTalkingtoyou.com and receive updates on her books, and travel destinations. I will be sharing my favorite hikes along the California Coast from Los Angeles to the Lost Coast in my California Daze Column each month. Triumphant Year for the" Lost Angel"
Africa has been on my list for about a decade. I finally made it in grand style this year. The Ultimate Safari with Overseas Adventure Travel that took me to less traveled tracks in Botswana, Zimbabwe and Zambia was everything I had hoped for. I wrote half dozen articles about my time there. Here is the link to my interview on Around the World TV.Here is a link to Into the Wilds of Africa featured in Real Travel Adventures E-zine. Collateral goodness from my journey brought me to Mat Dry, safari guide and owner of This is Africa safaris. He gave me the most flattering review that Lost Angel Walkabout has received to date! There is no other way to say it; Linda Ballou is an OUTSTANDING writer and an incredibly dynamic individual! 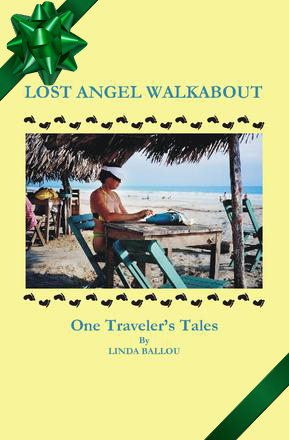 Lost Angel Walkabout is about as captivating a collection of travel tales as one could hope to read..
Mat helped me with my article The Elephant in the Room that I shared on Green Loons eco tours. I felt the need to bring awareness to an environmental problem that is not discussed because South Africans are afraid it will dissuade tourists from visiting their respective countries. Peter Steyn, editor of Globe Rovers Magazine headquartered in Hong Kong, reached out to me on Social Media. That is one of the really fun things about my writing journey. You never know who will stumble upon one of your articles, or books and find you interesting. This is the conversation that ensued and appeared in Globe Rovers along with the following book review of Lost Angel Walkabout. What a fun encounter. 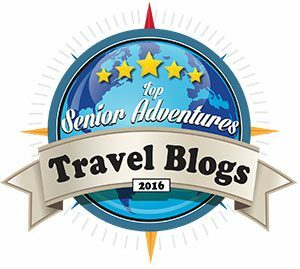 Check out his magazine for lots of great info on distant destinations for the intrepid traveler. Armchair travel makes a great gift for your travel loving friends!! www.lindaballouauthor.com or all online distribution sites.